The Higher Education Commission has launched a job portal that aims to improve the matching of PhD scholars with job opportunities. The job portal has been built on Rozee.pk, Pakistan's largest job placement platform, with over 30,000 active jobs and 1,000 new jobs added daily. The job portal will provide PhD scholars with access to opportunities in academia, research institutions, and, in the private sector that can leverage the unique skills they have developed in the pursuance of their PhD degree. Over time, the increased use of the portal will provide the Higher Education Commission with job data analytics that will help shape future policy. The portal has been linked with the unemployed PhD data collected earlier this year. The PhD scholars, who registered with the HEC, now have profiles created on Rozee.pk. These PhD scholars can start taking advantage of Rozee's sophisticated job matching algorithm and job alerting features. 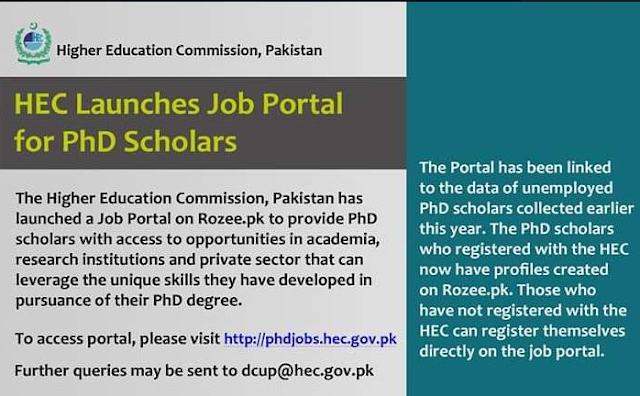 PhD scholars that have not pre-registered with the HEC can register themselves directly on the job portal. The candidate profile has been enhanced to include specific areas that are relevant to academia / research job seekers (i.e. publications, teaching experience, grant experience, etc.). PhD scholars are encouraged to complete the enhanced profiles on the job portal in order to improve overall job matching results and provide more information to prospective employers. Universities will be provided access to the jobs portal and have been requested to post their academic jobs on the portal. Employers already using Rozee will have access to the PhD Scholars that have been added to Rozee's candidate database. Pakistan Force. Powered by Blogger.